Today’s video is just a fun move where you use a 6 chord (in this case, A6) as the I chord, then D7 and E9 for the IV and V chord. By doing that, you maintain the same top note the whole time (the F#) which just gives a fun sound and makes the chords really flow into one another. That flow from one chord to another is called voice leading, and it’s the practice of keeping the movement (in actual notes, not necessarily fingers!) to a minimum. Jazz players are often really good at this, but most blues players could stand to think this way too, it sounds really great. I like the kinda jazzier sound Griff! Cool! The Music scale Matches the Calendar. 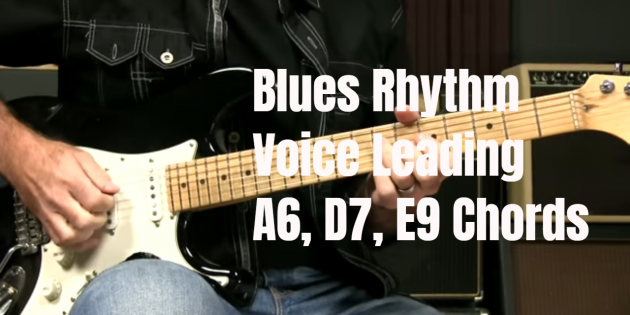 Like Larry and Dave said earlier, they’re just I IV V blues chords – with a little tweaking. But here’s a thing – A6 has the same notes as F#m7 (A, C#, E, F#), and F#m7 is the VI chord of the A scale. So if you substitute F#m7 for A6 in the progression you get VI IV V – and you’re playing hundreds of songs (transpose to A F G and hear the last part of Stairway to Heaven for instance). And now it’s plain to see why you can play the minor pentatonic over that progression – just like Pagey does in Stairway. Duke Ellington played mostly “simple” chords with 3 or 4 notes – he just left out the 1 and the 5 a lot of the time and played the extension notes, and he wrote many of the classic 20th century songs. Best tip since… the last one!!! Thanks for a great lesson. I believe Keith Richards described himself as a “lazy” guitar player. I presume he meant just what Griff indicated – keep it simple. Of course Keef keeps it really simple, he typically doesn’t have a low E string on his guitars! When he plays with only five strings he is tuned to open G.
in blues progression… hopefully you can make more lessons like this !!! I’ve noticed that a number of Griff’s videos in the recent past are purely YouTube. Up until now I have been saving the videos for future use, by downloading WMV files, and TABs where appropriate. This gives me the opportunity of going back over more copmpicated or complex ones as my skill improves. It is also good for refreshing skills tried and learned earlier in my guitar-playing life. It would be great if you could go back to giving us the option of saving the videos as WMV or even MP4, though that takes up more memory space. I’m sure many of your other followers would agree. Thanks in advance. VideoSurgeon has a sniffer tool… Now a separate thing called DownloadSurgeon i think. Grabs Youtube vids just fine. Can’t help with tabs if Griff doesn’t write them…. Really enjoyed that. Worked nicely on acoustic w/ thumb for bass A, (open) on I , then on 7th fret A for Ii, then open E for the E9 . Thanks, Griff—of all these internet guitar guys youre #1. The simple genius is it’s still just a 1-4-5 Blues in A. So you could use what you usually do, at whatever level you play. Minor pentatonic in A would work. Personally, I’d like A major pentatonic over the 1 chord (A6), then A minor pentatonic over the 4 and 5 (D7 and E9) that Griff talks about a lot. That A major pentatonic gives you the F# note and should really open up the A6 chord. You could use the chord tones of the arpeggios of each chord. Or, if you’re playing’s there, dive into modes. But you don’t need to. Once again, Griff’s made sounding incredible all so simple. Hope this helps, Larry. Apologies for jumping in, Griff, just excited by all the possibilities cooking with this A6 spice.